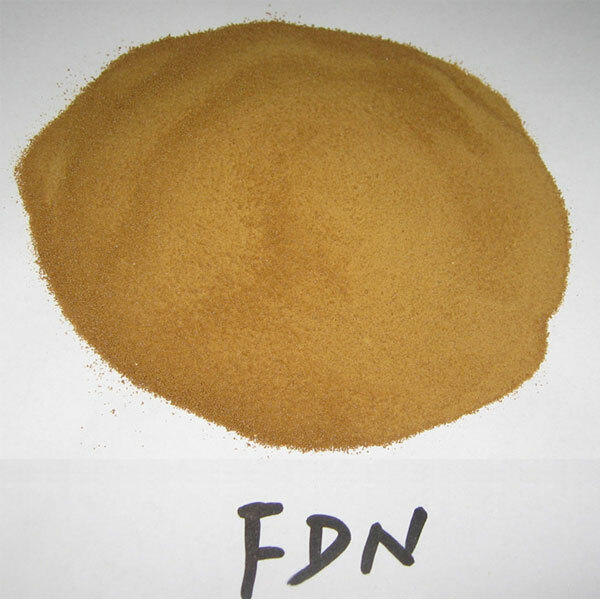 Sodium Naphthalene Sulfonate Formaldehyde | MUHU (China) Co., Ltd.
FDN-A is a high range water reducer, high concentrate naphthalene-based superplasticizer, also named Naphthalene Sulfonate Formaldehyde Condensate (NSF), SNF, PNS, etc. FDN-A is made of naphthalene, sulforic acid, formalin and alkali, through sulphuration, hydrolyzation, condensation and neutralization reaction. FDN contains no chloride. Thus, it meets the requirements of chemical admixture specifications for concrete: ASTM C 494, Type F; ASTM C 1017, GB8076-1997 and GB50119-2003. FDN-A superplasticizer can be applied to make flowable, strong or steam-curing concrete. The minimum working temperature can be as low as 0 degree C. In steam curing, concrete with superplasticizer has to be strong enough before heating. The steam curing specification has to be pre-tested. 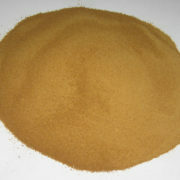 It is particularly used as base material for compound admixtures. FDN-A possesses the features of no retarding, no air-introducing, superplastic high water-reducing and strength enhancing. It has low alkali content, low sulfonate, and high purity. It can be widely used in different concretes with less dosage and easy to use. High water-reducing rate: FDN-A can reduce water more than 25%. It has features of superplasticizer, effectively increases concrete fluidity and reduces water penetration and segregation. Therefore, improves concrete placement and makes concrete easy to use and compacting. Strengthening: Given the same amount of cement and slump requirement, this product can increase the concrete stress by 50-110%, 40-90%, 40-70% and 20-40% on day 1, 3, 7, and 28 respectively. High applicability: It can be used with different variety of cement. It is compatible with other admixtures. It may be used with expanding admixture, air entraining admixture as well as fly ash for supplementary and catalystic purpose. Approporate setting time: It has less effect on the initial and final setting time. The difference in setting time generally is less than 1 hour. Low sodium sulfonate content: The aqueous solution has no crystals in winter, which can avoid pipeline congestions when FDN-A applied. Safety: No toxic, smell and radiation; no corrosion to steel bar; no flammable and explosive material. Effective durability: It can modify the structure of concrete and increase the property of anti-seepage, anti-freezing, and carbonization. Easy to use: It can be added directly or used after soluted in water. It can be used for different working condition and concrete mixer. 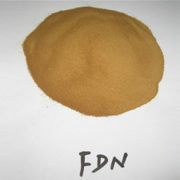 FDN-A can be added directly or added in after soluted. It can be added during mixing and after-mixing. The afterward approach can achieve better result. The suggested addition rate is 0.75%. Direct use of powdery agent is allowed. Alternatively the addition of the agent is followed by water moisturization (water-cement ratio: 60%). The agent can be combined with other agents if pilot development or laboratory test is satisfied. For powder: Woven fabric bag with plastic liner. Net weight: 25kg +/- 0.13 kg. Cautions should be taken to prevent packages from being torn by sharp-ended objects while being transferred or delivered. When being contaminated by high humidity or moisture in case of leakage, it can be prepared in prescribed ways for further use without surrendering any effect. It should be stored in a dedicated warehouse that is well-ventilated and dry. It remains effective in one year. After the expiration date, it can be used again if testing results fall within the established range.